Any house which is lived in nearly three hundred years has a long and complicated record; but when it is a triple house, composed of three original buildings, it is apt to have a very complicated biography. This certainly is true of the Colonial Inn. In order to keep events sorted out they are presented here in chronological order; some jumping back and forth from one building to the other is necessary to show what happened from year to year or decade to decade. 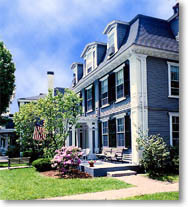 As you follow the story of the Colonial Inn much of the history of Concord itself unfolds from colonial times to the present. Because each of the three houses was known by a different name at different periods of their history, they are referred to here simply as the East House, the Central Building, and the West House. Their composite is now the Colonial Inn, which still faces Concord's old common. Also, be sure to read the Room 24 Ghost Story. 1687: Captain Wheeler left his land to his daughter Rebecca, wife of Captain James Minot, (J. Minot, 1653-1735). 1716: Captain Minot deeded this East House to his son James. 1759: James, Jr died, left "dwelling house, barns and all of the other buildings on the home lot to my son Ephraim." 1764: Jan. 20. Ephraim sold the property to Timothy Minot, Jr. (1726-1804), his cousin a physician, with 20 acres, bounded on the west by the Millbrook. Dr. Minot tended the wounded on April 19,1775. 1766: Dr. Minot mortgaged the property to another cousin, Samuel Minot, goldsmith, Boston. 1770-1775: Around this time, during the Minot ownership, the Central Building was erected, at west end of East House. It was described by townspeople as of one story, heavily timbered; it was used as a Provincial storehouse during the Revolution. 1780: Deacon John White hired the new building for a store, and lived in one end of it. He soon added a second story and moved upstairs. The store specialized in paints and oils, but also carried general merchandise; the sign said VARIETY STORE. 1789: Timothy Minot sold the East House to Ammi White, the cabinet maker, who, as a boy, was the one who killed the third British solder at the Bridge with an axe. He was the son-in-law of Dr. Minot, and added a long shop, or shed, to his East House. On this same day, Dr. Minot sold the Central Building to Deacon White. 1799: Oct. 30. Ammi White sold his East House to John Thoreau (1754-1801) of Boston, merchant, and a parcel of land as well as the additional shed. The Deacon's wife next door was sister of John Thoreau's second wife, Rebecca Kettel. The brothers of Esther and Rebecca ran the bakery in Wright Tavern. 1801: Thoreau died, his widow and children, including 14 year old John, continued residence in the East House with John Sr.'s two sisters, Sarah, a town seamstress, and Elizabeth (Betsy), who inherited the house. The boy John (1788-1859) worked as a clerk in the store for awhile. He became Henry David Thoreau's father. 1812: The Central Building, or store, passed from Deacon White to Merrs. Hemmenway and Shattuck, but White retained an interest in the store. 1820: About this date, Deacon White built a duplicate section at the west end of the store for his own house. It was his task to stop people from traveling on Sunday and he was especially strict about Lowell Rd. 1821: Daniel Shattuck, partner of Deacon White, who had been living over the store, bought the store and stock from White. 1830: Deacon White (Unitarian Church, 1784-1827) died. Shattuck bought the West House and moved into it. Dan Shattuck helped found the Middlesex Ins. CO. National Bank, Savings Bank and the Milldam Co. His brother Lemuel, who had been helping with the store since 1823, moved into rooms above the store, where he remained until 1833, when he moved to Boston to become a book publisher. Lemuel wrote the first history of Concord. He presented the first report ever given at a town meeting, and got a law passed making such reports mandatory throughout the state. He was founder of American Statistical Society, and the New England Genealogy Society. 1835-1837: Henry David Thoreau, his parents, sisters and brothers lived in West House with aunts Betsy and Sarah: Henry was a student at Harvard. 1839: Betsy Thoreau died. Dan Shattuck bought the East House. Eventually it was occupied by R.N. Rice, Mrs. Barlow, the Tolmans, Simonds, and many other tenants until 1885. Rueben Rice was manager of the Green Store, where the Catholic Church now stands, and then he went west to work for the railroads; he returned to Concord as a town financial benefactor. F.S. Simonds was the author of several history books. 1850: Shattuck made over the whole store building into a dwelling, which he rented to John F. Skinner; it was known as the Skinner House until late 1893. Dan Shattuck used the timbers of Deacon White's barn to build an ell on the Lowell Road side, about this time, and a stable for himself. These were famous timbers, - cut for the meeting house built in 1667, re-moved in 1710 when a new meeting house was built to erect a house for courts and town meetings on the south side of the common. Deacon White moved this old court building to the rear of his West House for a barn. 1855: The Central building became a boarding house. Soon this building was attached to East House and the combination was run as a small hotel called Thoreau House. It was run by several people, including Thatcher Magoun, W.E. Rand, and J. Tarleton. 1861: Dan Shattuck was still living in West House, but with his daughter Frances who was married to Louis A. Surette, Jr.; he deeded her this property and East House. Thomas Surette, the son, became a famous musician. 1865: East House owned by trustees of the town donations and run as a boarding house. 1900: About this time West House was attached to the Central Building; it was managed by Mr. and Mrs. Abrams, who gave the entire structure its present name, Colonial Inn. 1947: Ownership of the Inn taken over by the Grimes brothers, Luther and Loring. For 17 years Loring was resident director, and added the Prescott wing in 1960 and the dining room in 1973. 1988: When hotelier Jurgen Demisch became proprietor in 1988, he soon recognized that he had become caretaker to a landmark that is often a visitor's first introduction to Concord. Major renovations and redecoration of the Inn took place with wife Rebecca, and patrons responded to the high standards for food and service.